For weeks now, my television, and yours, has been saturated with political commercials for and against local legislative candidates. Some are attack ads focused on corruption and the supposed left or right-wing extremism of the opposing candidate. Others center on taxes, healthcare, and the ostensible "hordes" of immigrants approaching the U.S. in a troublesome caravan. But none, I repeat, none, say a thing about American foreign policy, the nation’s ongoing wars, or the exploding, record defense budget. The reasons are fairly simple: while the populace reflexively (over) adulates our "heroes" in uniform, it has been programmed to ignore the actual travails of our troopers. So long as there is no conscription of Americans’ sons and daughters, and so long as taxes don’t rise (we simply put our wars on the national credit card), the people are quite content to allow less than 1% of the population fight the nation’s failing wars – with no questions asked. Both mainstream wings of the Republicans and Democrats like it that way. They practice the politics of distraction and go on tacitly supporting one indecisive intervention after another, all the while basking in the embarrassment of riches bestowed upon them by the corporate military industrial complex. Everyone wins, except, that is, the soldiers doing multiple tours of combat duty, and – dare I say – the people of the Greater Middle East, who live in an utterly destabilized nightmare of a region. To find the few brave voices willing to dissent against the foreign policy consensus, one must look to the political margins of the libertarian right (i.e. Rand Paul) and the democratic socialist left (i.e. Bernie Sanders). This is a sad state of affairs on an election day that both Donald Trump and Barack Obama have assured us is the "most consequential" of our lifetimes. You see on this point I actually agree with these two polar political opposites. This is a vital election, only not for the reasons we’re told. This November 6th is profound because it demonstrates, once and for all, the utter vacuousness of American politics. So where does the U.S. currently stand on foreign policy today? Well, it is actively bombing seven countries, has up to 800 military bases in 80 countries, has combat troops, special forces, drones and/or advisors on the ground in (or in the skies above) Syria, Iraq, Afghanistan, Somalia, Yemen, West Africa, Libya and Pakistan, among others. Occasionally, American service-members are still dying across the Middle East – often in treacherous insider attacks, in which they very people we "advise and assist" turn their weapons on our troops. Furthermore, it is unclear that the US is either "winning" – whatever that means anymore – or accomplishing anything of note in any of these locales. For example, in the longest conflict of the lot, Afghanistan, all the key metrics indicate that the US is losing, both politically and militarily. As for the other ongoing wars in the region, no one – not the generals or the civilian policymakers – seems capable of articulating an exit strategy. Maybe there just isn’t any. Still, none of that will be on the ballot today, when Americans queue up to vote for their favorite teams. 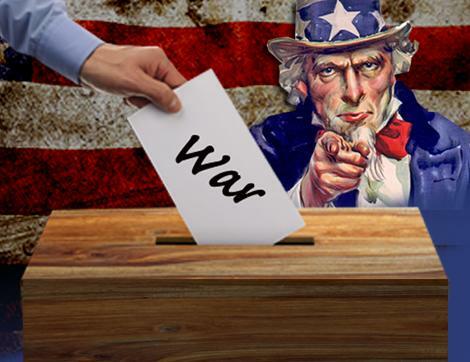 They’ll be casting ballots based on the illusion of differentiation between two highly corporate political entities that are squarely in the pocket of the weapons’ industry and their Wall Street financiers. And, tonight, when the media outlets dazzle their viewers with holograms, charts, and other neat toys depicting the day’s winners and losers – not one station will even utter that naughty word: Afghanistan. What all this illustrates, in sum, is that the citizenry doesn’t really care about the troops, and neither do their elected leaders. Soldiers are political props and little else – meant to be "thanked," paraded at sporting events, and then effectively ignored – the new American way. The republic, or, more accurately, the empire, is in real trouble when – in the midst of its longest conflicts ever – war is not even on the agenda at the polls today.